Founded in 2004, Christé Blue is a couture boutique committed to providing unique, high quality NEW, vintage and contemporary garments, accessories, and fine goods at a fraction of the market price. Christé Blue carries a full line of designer, upscale resale and vintage apparel for all occasions as well as NEW, estate and costume fine jewelry, original artwork/sculpture, hardwood furniture, Italian leather seating, and eclectic gifts. Owners Susan & Matt Cafiso travel throughout the country to source odd and eclectic, vintage collectibles and one of kind new inventory to Christé Blue shoppers! 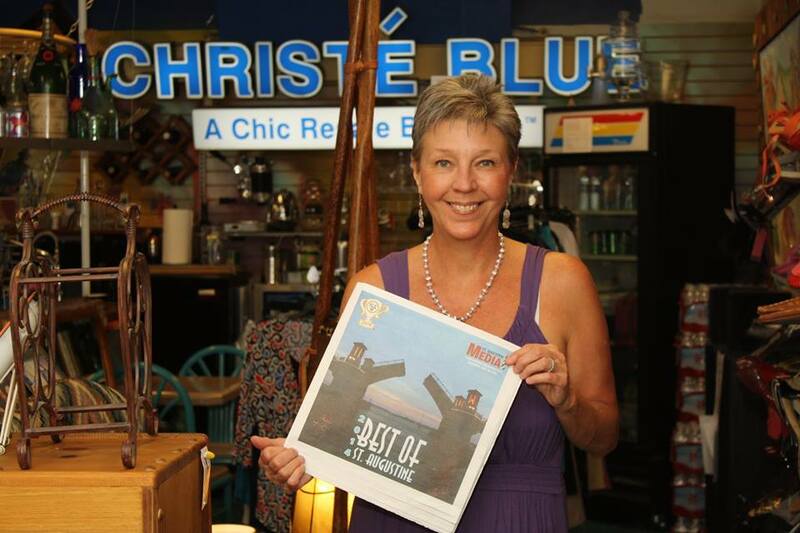 Susan celebrating Christé Blue's third consecutive win for "Best Consignment Shop" in the 2014 Best of St. Augustine annual awards.